Following the award ceremony of the first UCLG Peace Prize, last October at the UCLG Congress in Bogotá (Colombia), a publication to make available the wealth of good approaches in peacebuilding has been published. It was presented at the new year’s reception of VNG International, where a first copy was handed to Mr. Mpho Parks Tau, UCLG’s new President. In his speech, Mr. Tau emphasized the importance of local governance in implementing the 2030 Agenda and achieving the Sustainable Development Goals, and particularly peace and justice. Subsequently, Mayor Ton Rombouts, Chair of the international committee of VNG and Vice-Chair of the UCLG Committee on Development Cooperation and City Diplomacy, underlined the role for local governments as operators of peace and expressed his joy of having had the honour to award the 2016 edition to the municipality of Kauswagan (Philippines) for its comprehensive disarmament and reintegration programme named ‘From Arms to Farms’. 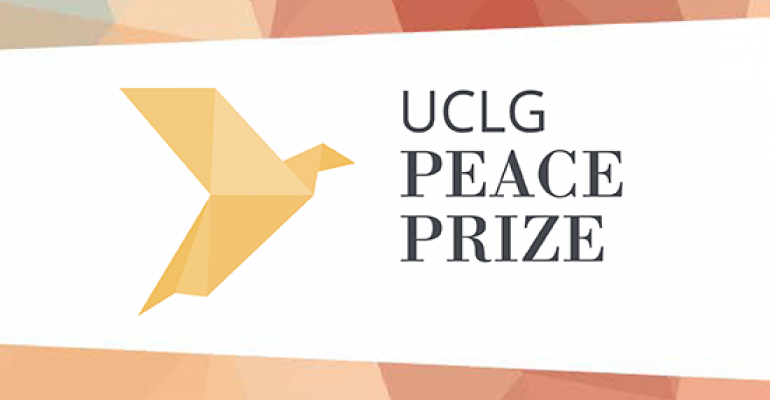 These and other cases that have been listed as finalists for the Peace Prize are further described in The UCLG Peace Prize 2016. Local Government Initiatives for Peace. The publication also includes background information on the Peace Prize. We wish you happy reading!